It was during her ocean racing days that Dame Ellen MacArthur, who broke the solo non-stop round the world record, fully understood what the word ‘finite’ means. “What you have on that boat is all you have. There is no more. You enter a completely different mental state,” she explained to participants at the FFA2017. From that personal experience she drew a more fundamental lesson: our global economy is no different to that boat. “What we have available to us is finite, yet the speed we are using those resources appears to be ever increasing,” she added. What is required is a paradigm shift from the current linear economy to a very different model: a circular economy, where from the outset materials are valorised and designed so they retain their highest value and utility at all times. “This model is not about slowing down the use of resources to buy more time, but about being restorative and regenerative.” It applies both to biological loops, such as human waste and biologically decomposable items, and to technical materials, like plastics, metals and polymers. 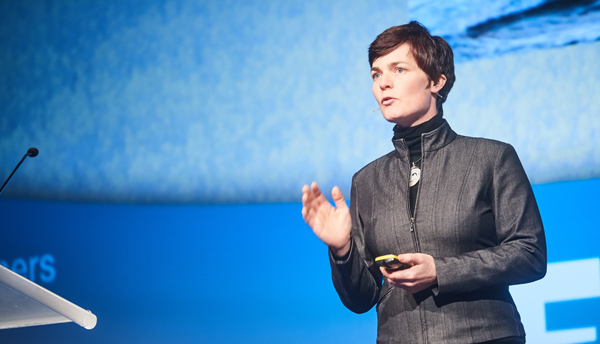 The realisation led to the launch, nearly seven years ago, of the Ellen MacArthur Foundation with the goal of accelerating the transition to a circular economy. It works with young people from around the world to explain the concept – “they get it immediately” – and with businesses, cities, regions and governments. It also undertakes systemic initiatives to try to understand particular material flows. Three basic principles underpin the circular economy: preserve and enhance natural capital; keep products, components and materials at their highest value and utility at all times; and foster system effectiveness by looking at the entire economy as interconnected and interrelated.